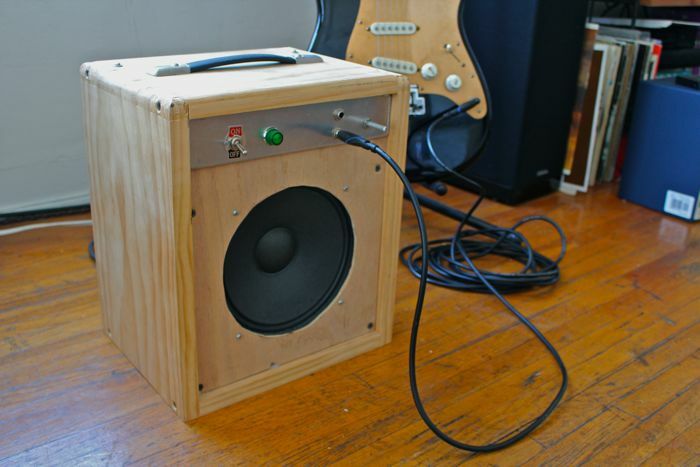 This page documents a guitar amplifier project I completed in 2011. It works and sounds great; it has served my primary amp that I play at home for over a year now. I might cover the cabinet; I might not. I've also thought about just painting it in a glossy color. The basic design (schematic, layout) is that of a Fender Champ 5F1. It uses a 12AX7 for the preamplifier section and a 6V6GT for the power amplifier section in a cascaded Class A configuration. I also decided to keep the original tube power supply (using a 5Y3GT rectifier). Approach high voltage DC electronics (such as a guitar amp) with EXTREME CAUTION...POINTING AT THE WRONG THING CAN KILL YOU. My advice would be to find a person that repairs old tube televisions (or at one point in time did). Or maybe find a store that still sells tubes and hang out there a bit...learn from others...DON'T DIE! If you are trying to do a similar project and want to chat, send me an email!